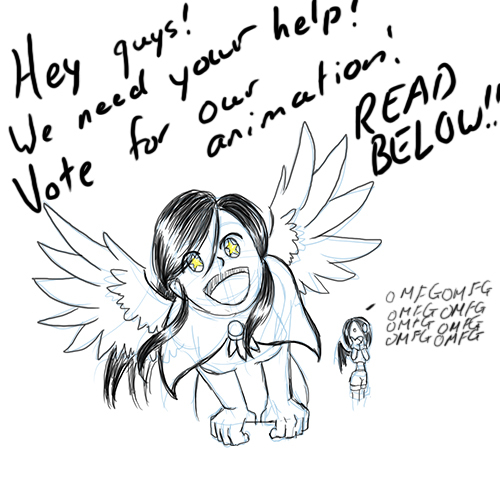 Visual Diary of My Life:: Animation Contest! Public Voting! 2 AM Spontaneity Day in the Life Enter An Double Facepalm Inspiration...? The Early Years 01 - First Meeting An's Role Things that happen while Es is in charge... Art Post 1: Don't Let Me Get Me Halloween Special Regression The Early Years 02 - Chains Buggy Buggers Please Wait... Art Post 2: Hope... Procrastination Just walk away... The Early Years 03 - Clothes We Wear Fangirl Jade Art Post 3: Masquerade In a Rut FPSs - Fear Por Scarlet screens The Early Years 04 - Denial Digital Vs. Traditional Toy Aisle Raid Part 1 Art Post 04: Rock n Roll You're Late! Inside The Early Years 05 - Dreams Thanksgiving Special Food Groups Art Post 5: Collage of An/Es/Heidi Toy Aisle Raid Part 2 Back 2 school... Back 2 school... ... To be made a fool. The Early Years 06 - What's Wrong With Me?! Just because... I AM GUNDAM! Art Post 6: Collage of An/Es/Heidi - Progress Please? Pick Up Part 1 The Early Years 07 - Animorphs MindF()!K Pick Up Part 2 Art Post 7: Gown Fitting Interwebz Not in the mood... Aftermath Wait, Whut? An entry that's 15 years old... Store Issues The Early Years 08 - Should've kept her... Thin walls... Crappy food... Art Post 8: Merry Christmas! "Trying" Present! The Early Years 09 - Crush Crushed Impulsive Shock Driving New Year's Letter I R Short Fan Fail The Early Years 10 - Art Roots? Jinx It One Man's trash... Art Post 9: Internet Surfing I am... Snow! The Early Years 11 - Living on a Prayer Jinx It 2 Waiting... Art Post 10: An and Young Es Digi Digi Cookies The Early Years 12 - No Words Needed Responsibilities Sleepy Art Post 11: Es with Young An Fashion Q Smelly The Early Years 13 - Where's Daddy? Live Entertainment Grocery Run Art Post 12: Angel Angela Commercials 1 Bishounen The Early Years 14 - Photograph The Gloves Come Off Visiting Art Post 13: Dark Devil Estrella Sometimes Addiction The Early Years 15 - Acknowledgement Priorities hurt Bonk Art Post 14: In My World Punch Out Valentine's Day 2012 Game Face The Early Years 16 - Gifted Sleeping Position Speed of the Internet Art Post 15: Caramelldansen BLAHBLAHBLAH Fanfiction The Early Years 17 - Nicknames 5 More Minutes Doodler rant Art Post 16: An Character Sheet Crazy Boogie Bam Dance The Early Years 18 - Ms. Perfect What makes Es happy Tales of Insomnia 1 Art Post 17: Es - Speed Drawing Stress Relief Backfire Yin and Yang Height Issues FangirlFangasmFanfiction Art Post 18: Angela the Muse Waiting for that email Concentration The Early Years 19 - Zoology Interviews and Weather Sometimes 'Flipped' Art Post 19: Estrella Character Sheet PQRN Aries 1 The Early Years 20 - My Dream... Busy Day Ahead Don't Buy It Art Post 20: Spring Rains Trash Comparison Aries 2 - Anspiring The Early Years 21 - Jessica Ruined Childhood Let's Play! NO MORE COMIC Spring is in the Air Aries 3 - Insomnia Crap It Out! Bothersome Drawing Aries 4 - Bad Habits The Early Years 22 - Best Friend Character Affinity Destroyed Dreams 1 - Broken Art post 21: Inner Turmoil Destroyed Dreams 2 - Lights are on... Destroyed Dreams 3 - Birthday Blues The Early Years 22 - Stories Destroyed Dreams 4 - New Schedule Destroyed Dreams 5 - Childish Art Post 22: Still Standing Destroyed Dreams 6 - Rememberance Hostage? The Early Years 23 - Trash Thanks! Packing Art Post 23: Coming Soon Guest Comic - Segadroid Hiatus Results? Willpower The Early Years 24 - Dark in Light How to Write Stories by An TIME Es's Feelings - "The Unloved" Art Post 24: Candycane Poptarts Promotion Bum kicking Young Meets Old The Early Years 25 - Cry 'Boyfriends' Job Questionaire Art Post 25: Never Surrender The Early Years 26 - Embarassment Ungh Fans Es-inine Escapades 1 Es-inine Escapades 2 The Early Years 27 - Perfect not so perfect Es-inine Escapades 3 Es-inine Escapades 4 An-sane 1 An-sane 2 The Early Years 28 - Stop Bullying An-sane 3 An-sane 4 Job Hunting Density-- I mean Destiny The Early Years 29 - Stand Up Girl Why...? Jynx Yourself The Early Years 30 - Apologize Requirements They Might Be Too Young Move In The Irony Early Years 31 - Jelly First Impressions Stupid Emotions Outdoors A Tall Hurdle Spoilers! But first... Raise You Up IT'S A SNAKE Team Name FAQ Fail There's always a catch Human Pyramid It's Not That Bad The Wall Wake Up Call Birthday Bumbling GayGene Feeding Leash BanStory Roleplay Denial Dodge THAT POKEwar Promo Art - An and Es Neglectful Determination Announcement Anticipation Postpone Product Procurement Tease 7 days Updates Part 1 Updates Part 2 Updates Part 3 Updates Part 4 Updates Part 4 - Special Watching anime with Bryan Bentou, bentou... Why does everyone...?! Living on Sweets New 'Pet' Welcome Home! Beach time! You're an angel! Lethargy Halloween Hype Jumpy Art Actuality Roadsave Bedtime Cooold Restaurant Benefits Fake Hits GPS Fail Visiting Friends International Chopsticks Art Talking An's Forgetfulness WHERE IS IT!?! - Es's Forgetfulness Anniversary! Two pens are better than one Art Funnel RAGETYPING RAGETYPING animated New Years Resolutions Expectations vs. Reality Fleeting Feelings Civilization Scritches I want to be a magical girl! Snow Day Can't Think Critique Wallowing Hey! Listen! Hypocrisy No Fighting! Calm down... Mend the Bonds The Uses of Tape It'll be okay... right? Can you come in? Why again...? Flipping Poor Drained Off Game Wallowing Haunted The Purpose of Dreams The Days - The Nights Vacay! Send to the presses! Planning Part 1 Last Time Thank You Planning Part 2 Planning Part 3 Dress Shopping Part 1 Dress Shopping Part 2 Dress Shopping Part 3 Dress Shopping Part 4 Es in a Dress An. Sthap. Plz. Just Browsing How much...? Comic Update Plans Vacation Realization Merry Christmas 2015! New Years 2016 Pundertale Fan Disservice Travel Montage FINALLY Satisfaction Leaving Port Feeling Off Still Feeling Off Feeling a bit better...? Maybe Better Definitely Better... ... Say Yes Off To Dinner Group Dinner Introductions I am an artist. That's The Dream...? Good Job... but A Much Needed Talk I Think... ... I Lost My Way The First Stop Best Vacay Ever? Second Stop Start Safe Right? Now or Never Follow the... red light? Arrival Anticipation Bioluminescent Bay Halfway There Concerned Fiancé Avowal Ease Your Mind Relaxation Home Sweet... Wait... Jealousy Welcome Back! I'MSOHAPPYFORYOU!! Welcome Back Gifts I WANT TO... Quit...? Demons Amen Distractions and Panic Overwhelmed by Undertale Hey Es, What'cha Playin? Made An a Fan An Fangasming Hesitation Green Lit Assembly Line Second Job Going a little too well... Simmering Storm Storm Off Reflecting Pent Up Rage Break Down You Are We have to! Invitation Animation Contest! Public Voting! I really can't promise anything on VDomL at the moment, but I am posting silly nonsense every weekday over on the Facebook page. I'll probably dual post it to my Tumblr as well soon. Click here and vote for me! Visual Diary of My Life by Heidi S. Reyes is licensed under a Creative Commons Attribution-NonCommercial 3.0 Unported License.